Serve this beautiful braise with creamy polenta or fluffy Basmati rice. Dust off you Dutch oven and let’s get cooking. You’ll need lamb shanks. I trimmed the heck out of them, removing some fat and silver skin. 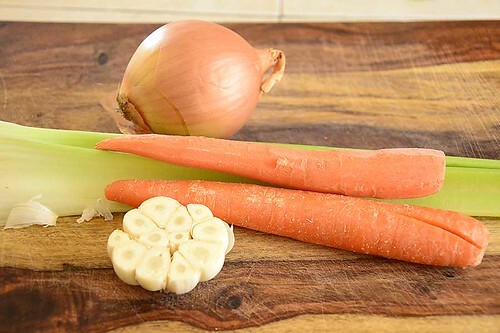 carrot, celery, onion, garlic and some chicken and beef stock, dry red wine (I have red wine substitutes listed at the end of this post with the recipe) bay leaves and black peppercorns. Don't worry about tying up the bay leaves and peppercorns, they will be strained out later. 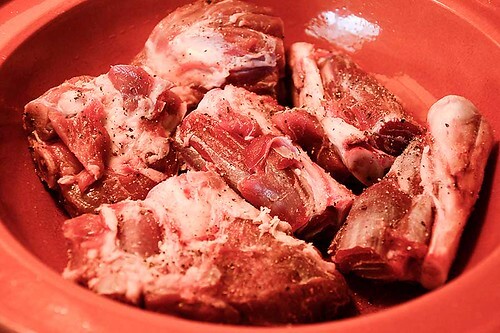 Return the shanks to the pot, cover and cook for a few hours until the lamb is pull off the bone tender, remove the shanks from the liquid. Strain the liquid and remove the fat from the liquid. I used a spider to scoop the vegetables from the liquid rather than pick up the tagine and pour it through a sieve. Bring the liquid to a boil to reduce, then return the shanks to the liquid. pot. Return the shanks to the pot and bring up to a boil over high heat. Lift the shanks from the pot and set aside, covered, to keep them warm. by half and the consistency is sauce like. Return the shank to the sauce. care the garlic does not burn. from the heat and stir in the butter. until wilted. Season with salt to taste. 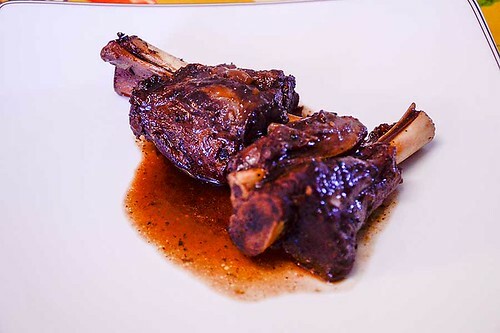 Reheat the lamb shank and sauce over medium heat until heated through. sauce over the shank and serve.